Brigader General William H. Lytle. 36th Illinois - Colonel Silas Miller. 88th Illinois - Lieutenant Colonel Alexander S. Chadbourne. 21st Michigan - Colonel William B. McCreery. 24th Wisconsin - Lieutenant Colonel Theodore S. West. Before daylight September 20th the Brigade was brought from Lee and Gordon's Mill to this position and formed with Laiboidt's Brigade on its right and Bradley's (Walworth's) in reserve. About 11 o'clock Laiboldt was ordered to the vicinity of the Tan Yard. General Sheridan was ordered to proceed with his remaining brigades to General Thomas. He moved double-quick, Lytle's Brigade being in advance. 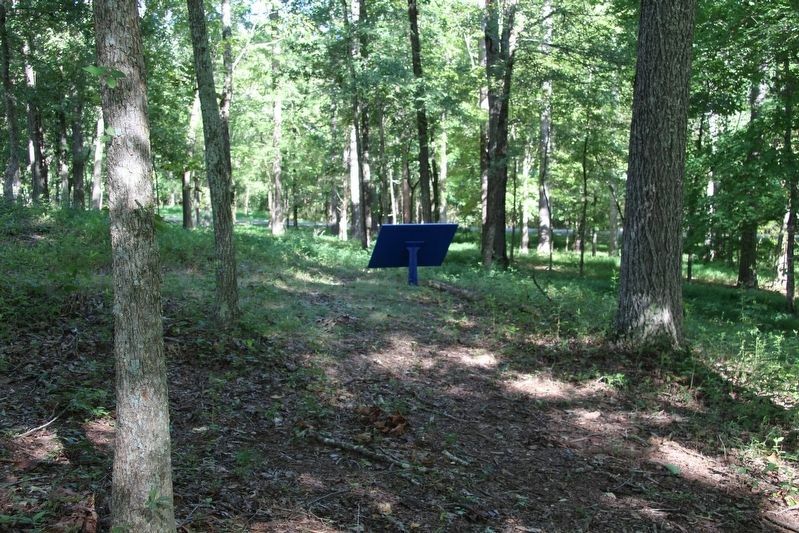 View of the tablet, looking east, along a park pathway, in the middle of the woods. , in Walker County. Marker can be reached from Glenn-Viniard Road north of Wilder Road, on the right when traveling north. Touch for map. 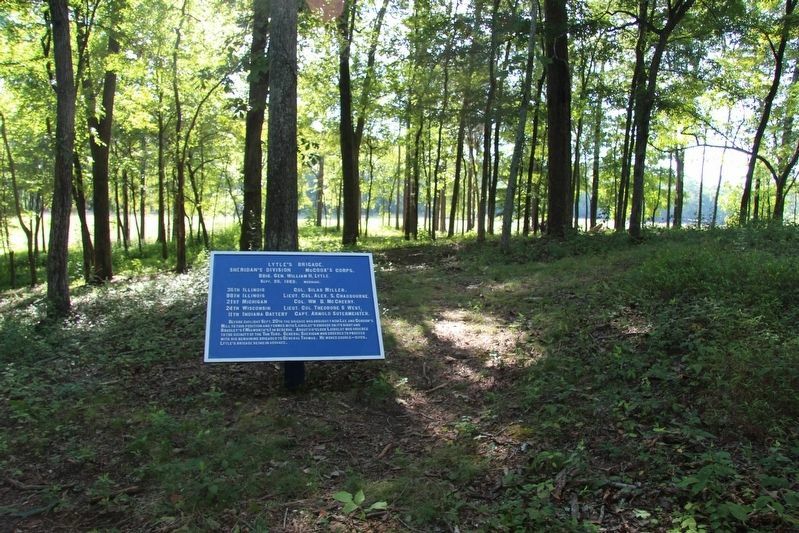 This marker is located in the national park that preserves the site of the Chickamauga Battlefield, a moderate distance off a park roadway (Google maps show road as Vittitoe-Chickamauga Road, NPS map show road as Glenn-Viniard Road), north of the Wilder Tower, in a thickly wooded area, along a pathway. Marker is in this post office area: Fort Oglethorpe GA 30742, United States of America. Touch for directions. Other nearby markers. At least 8 other markers are within walking distance of this marker. 27th Illinois Infantry (within shouting distance of this marker); Battery G, 1st Missouri Light Artillery (within shouting distance of this marker); 72nd Indiana Mounted Infantry (within shouting distance of this marker); 39th Indiana Mounted Infantry (about 300 feet away, measured in a direct line); Widow Glenn's House Site (about 300 feet away); Field Headquarters Army of the Cumberland. 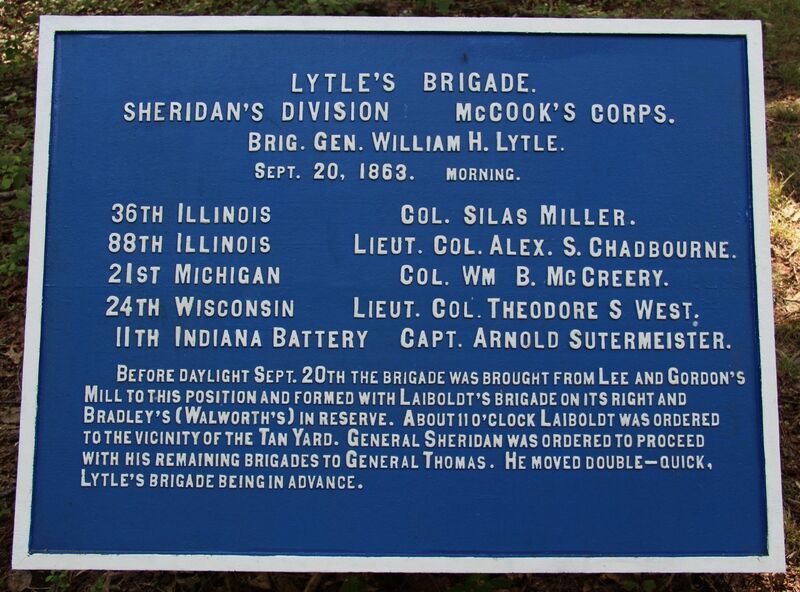 (about 300 feet away); 98th Illinois Infantry (about 300 feet away); Wilder's Brigade (about 300 feet away). Touch for a list and map of all markers in Fort Oglethorpe. View of the backside of the tablet, looking west, situated in the midst of a wooded area. More. Search the internet for Lytle's Brigade. Credits. This page was last revised on July 3, 2017. This page originally submitted on October 21, 2016, by Dale K. Benington of Toledo, Ohio. This page has been viewed 165 times since then and 6 times this year. Photos: 1, 2, 3. submitted on October 21, 2016, by Dale K. Benington of Toledo, Ohio.